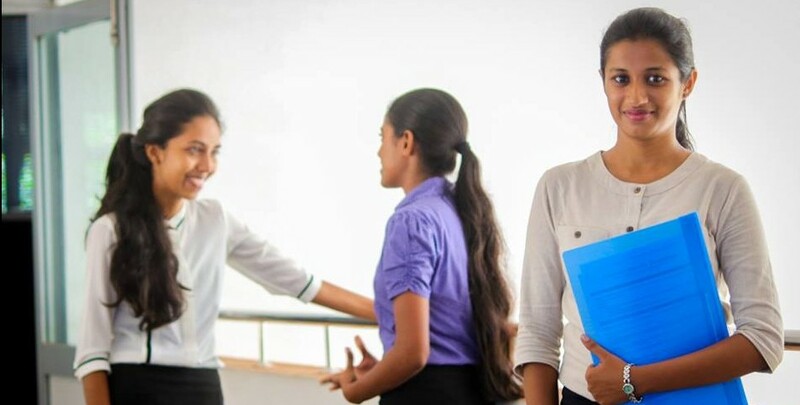 The University of Sri Jayewardenepura has always been a well reputed educational institute that produces highly qualified and well-rounded undergraduates to the academic and industrial world. In 2013 the Faculty of Applied Sciences in University of Sri Jayewardenepura introduced a new four year degree program, known as ‘B.Sc. (Hons) degree in Applied Sciences’, which is specifically focused to cater the industrial needs. This degree program covers areas such as, Management Science, Statistics, Computer Science, Mathematics, Physics, Chemistry, Economics, Plant Biotechnology, Plant Biology, Environmental Management and Forestry &amp; Polymer Science and Technology. 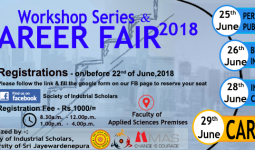 With the two years’ progressive existence of the degree program, the ‘Society of Industrial Scholars’ was formulated by its student body in 2016 with a motive of continuous improvement. 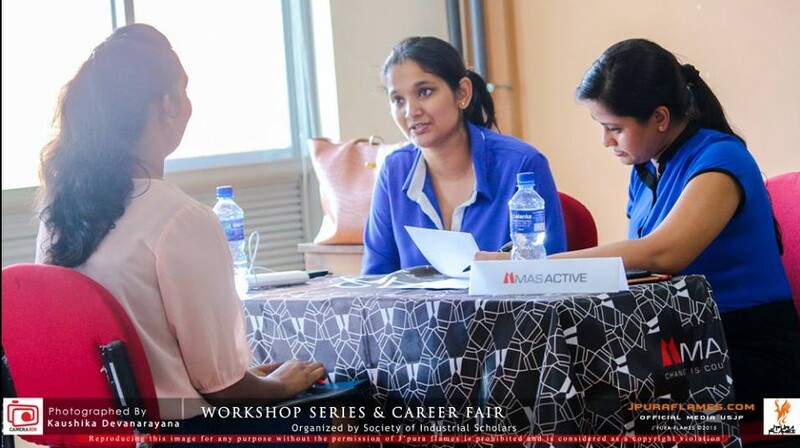 The first biggest event organized by this society, “The Workshop Series &amp; Career Fair 2016” was a remarkable event in the history of the Faculty of Applied Sciences in University of Sri Jayewardenepura. The initial objective of this event was to find internship opportunities for its students, in order to complete an implant training coupled with an industrial based research in their fourth year final semester as part of the degree program. However later, the objectives developed to ‘bridging the gap between the University students and the industry’ in terms of leadership, soft-skills and public speaking skills. With this new objective the whole event was opened for all the interested undergraduates and recently passed out graduates. Preparations for the event commenced with setting up the Organizing committee 3 weeks prior to the event. The Organizing committee of the Society of Industrial Scholars included 21 energetic undergraduates from all different fields who worked day and night providing ultimate contribution. 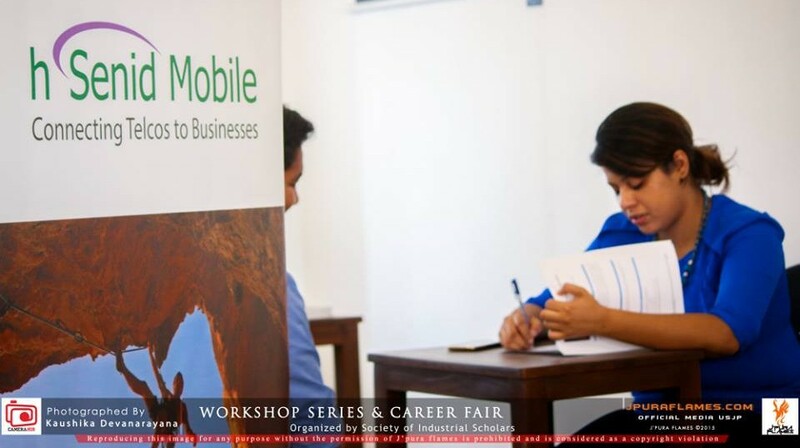 Workshops organized by the Career Fair organizing committee, worth a special mention here. From 25th to 27th April 2016 a series of workshops was conducted by well reputed resource persons. The opening ceremony was graced by Mr. Mahesh Jayasinghe, the Executive Coach and Consultant of Mpower Softskills Pvt. Ltd. with a spectacular and persuasive session on leadership, followed by illustrative sessions on soft skills development and personal grooming on which added value for the whole series. The session on public speaking was conducted by the Toastmaster Sandun Fernando, which inspired the audience to a greater extent towards developing their English vocabulary and effective use of postures and gestures while addressing a gathering. The thought provoking session on Interview facing session was conducted by Ms. Ayona Hettiarachchi, HR Executive MAS Intimo, Biyagama, giving a full insight to students on how to face an interview which helped them immensely to get through the career fair interviews confidently. Most importantly the session on CV writing was conducted by Mrs. Chathurangani Tennakoon, Career Advisor at the Career Guidance Unit in the University. 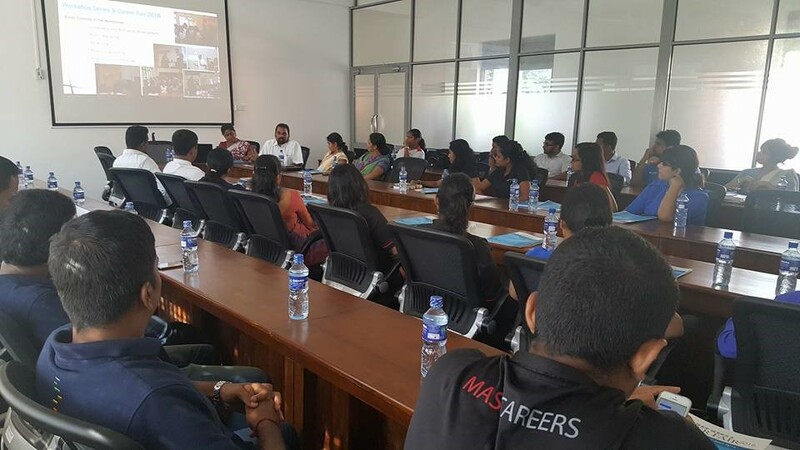 On 29th of April the Career fair 2016 commenced with the special discussion ‘Industry-University Linkage’ between Prof. Sudantha Liyanage, Dean of the Faculty of Applied Sciences & Dr. Pahan Godakumbura representing the University and 42 Industrial representatives from top Companies in Sri Lanka. The Career Fair marked a milestone in the history of events organized by the Society of Industrial Scholars with the valuable participation of top companies in Sri Lanka including MAS Holdings, Brandix, Astron Limited, Coca-Cola, Sampath Bank, Hayleys PLC, Millennium IT, hSenid, Hirdaramani, Embla Software Innovations, etc. Interviews were conducted on the day of the career fair by these companies,who were given the choice of either sort applicants themselves on the event date or to conduct walk in interviews. As per the records, 149 well-groomed, fresh undergraduates equipped with knowledge and experience gathered from the workshops, confidently faced the interviews throughout the day. It was a very joyful news for some of them as they were directly given the letters of appointment, and some were invited for follow up interviews on the same day. Just after a two weeks’ time when looking back at the event, it was a huge task, more or less a very challenging one considering the limited 3 weeks’ time frame given for organizing. But the committee’s dedication, hard work, determination &amp; the proper guidance and support extended by Dr. Pahan Godakumbura, the Coordinator of the B.Sc. Honors Degree Program has finally enabled the completionof the event with so much of success. Within the two weeks’ time after the event more than 45% of the candidates has been selected or has been invited to follow up interviews by the companies. Following the enthusiastic feedback provided by both; the companies &amp; the participants, the organizing committee expects to conduct a second series of workshops and Career Fair in 2017. Looking at the success of the event, the organizing committee of Society of Industrial Scholars extends their heartiest appreciation and well wishes for all participated organizations &amp; their representatives, MAS Holdings for being their biggest support as the main event sponsor, Brandix Group for being the printing partner and Astron Limited providing great support in making this event a reality. Also a special word of thanks is extended to Prof Sudantha Liyanage, dean of the Faculty of Applied Sciences and Dr. Pahan Godakumbura, the coordinator of the B.Sc. Honors Degree program for the countless support given throughout the organizing of this event.